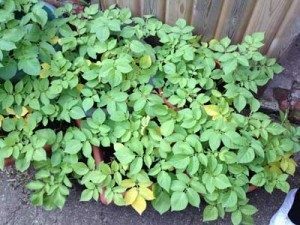 My friend has some potatoes in a pot that are going yellow and look unhappy and she’s not sure why…can you help? Here is a closer up picture. They are in pots and it seems to be the leaves nearest the sides which are yellow. TopVeg replied: Yellow leaves could result from several problems. 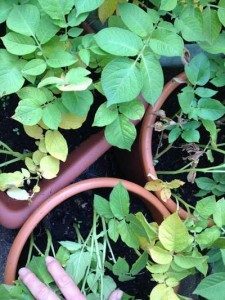 Water-logging causes yellow leaves – Do the pots have drainage holes in the bottom? The pots must be able to drain. Poor nutrition also leads to yellow leaves. Is the soil in the pots good quality? Has any fertiliser been given to the plants? There is a lot of foliage in the photos and that will need feeding. I have asked my friend and she said that the pots don’t have drainage holes as she didn’t realise this was necessary. She also hasn’t fed them anything. Should she move them into a dryer location? Would normal plant food work or is there a special feed for potatoes? Water will be the over-riding problem in this case. We have had a lot of rain, which will have filled the pots & it will not be able to drain out if there are no holes. If you are able to tip the pots onto their sides without damaging the plants, some of the surplus water could drain out. A drier location would help but the pots will be very heavy. Perhaps you could put some polythene ( like a black bin liner) under the foiliage but over the soil, to keep any future rain out of the pot. I would not bother feeding them unless you plan to keep them growing a long time. It would be better to harvest them as soon as they are the size of an egg – as they will be very vulnerable to potato blight. This is a fungal disease which strikes in damp, humid conditions. Hope this helps & that you enjoy your home-grown potatoes! !